Since the retail phase-out of less efficient incandescent light bulbs, there has been a major shift to LED bulbs. When you purchase these, you might notice that they’re characterized not only by lumen ratings (brightness) and wattage but also by correlated color temperature (CCT). When you think incandescent, you know what light bulb color temperature to expect. Traditionally, incandescent bulbs have given off a warm, yellow-colored light. LED bulbs, on the other hand, are available in a variety of colors from classic warm white to cool (bluish) white that mimics natural daylight. Lights—and the shades of white that they emit—can be used to influence how a room looks and how colors are shown. 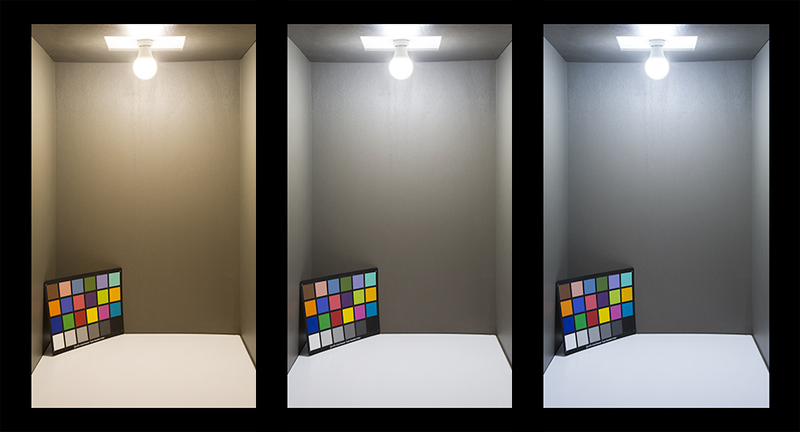 Before discussing which light bulb color temperature is best for each environment, it’s important to fully understand CCT. 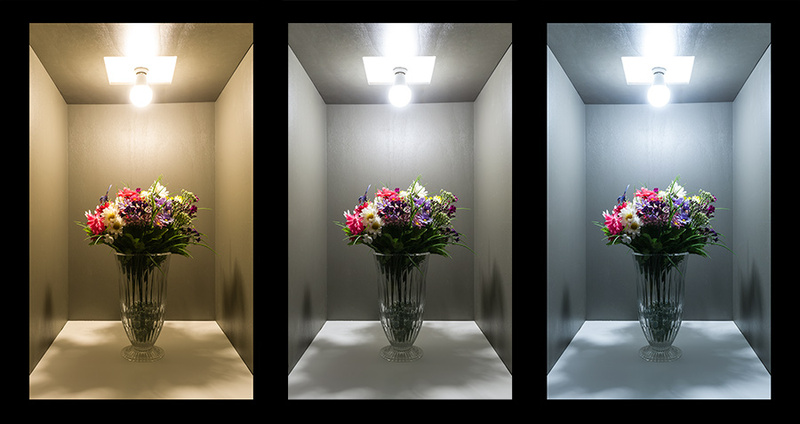 Correlated color temperature will tell you what hue and tone of white to expect from a specific bulb or fixture. It’s measured in Kelvin (K). Different temperatures on the Kelvin scale represent different colors. For example, light at 2000K-3500K looks more orange/yellow and is called ultra warm or warm white, and as temperature increases in Kelvin, color changes to more of a “paper white” known as natural or neutral white (between 3500K and 5100K) and finally into a bluish-white known as cool white (5100K-20000K). Depending on where you’re shopping, light bulb color temperatures might not have the same names. For example, what Super Bright LEDs calls warm white, natural white, and cool white, other retailers might classify as soft white, bright white, and daylight. 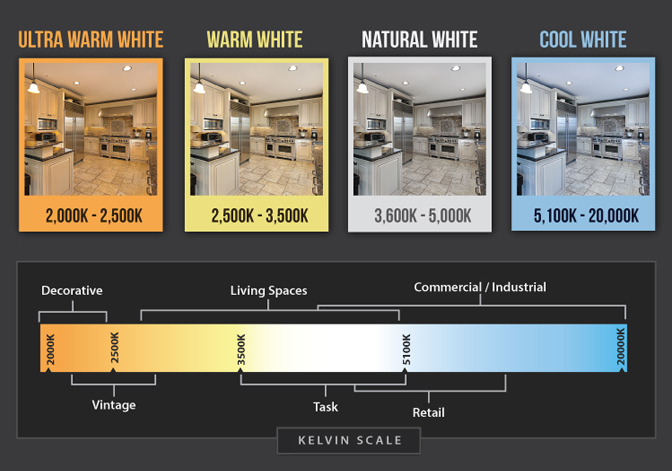 What’s important is color temperature in Kelvin. Regardless of what a store calls a certain Kelvin temperature or kelvin temperature range, a 2700K bulb will appear the same color from one store to another. When you’re choosing an LED bulb, it’s best to plan for the atmosphere you want to create or the feel the room already has. Classic warm white bulbs have low CCTs. They will add a warm yellow hue to the colors in a room, and because of their warm color, they might not appear as bright as natural or cool white bulbs. With that being said, in-home offices, kitchens, bathrooms, and utility areas, such as basements and storage closets, could benefit from bulbs with a higher color temperature. These spaces are often used to complete tasks, and because warm white light is designed to create a relaxed atmosphere, high-CCT, crisp lighting would be ideal. However, it’s your space; design it to your liking and as you see fit. One thing to take into account when you’re choosing light bulb color temperature is that it can change how you see paint and furniture colors when the light is turned on. Warm white light can add a yellow hue to white paint or make other colors look muted in comparison to natural or cool white light. Similarly, cool white light has a blue hue. 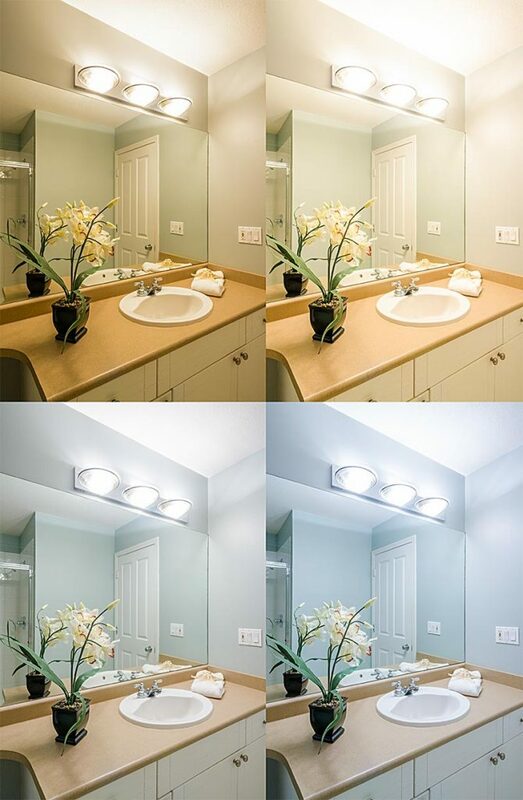 How warm, natural, and cool white light changes the appearance of things in a room. Notice flower colors stand out and are more realistic under natural and cool white light. Generally, the lower the CCT, the more flattering the lighting effect. Higher CCTs can show more blemishes or imperfections, but they also make colors look crisper—similarly to how they would appear outside in natural light. This information might help you decide which color is best for your bathroom, for example. Say you’re doing your hair or makeup in warm white light; you’ll notice less flaws. If you’re doing the same under natural white light, you might notice more work that could be done. This can be a pleasant or unpleasant experience depending on your goals when it comes to these tasks. Below is a list recommended light bulb color temperatures best suited for types of rooms or environments. As always, the color light you choose is completely based on your goal for the room and the vision you have for it. Just because you own a retail store doesn’t mean you have to choose natural or cool white light. If your store is meant to be more of a relaxed atmosphere, you might prefer warm or ultra warm white light. The same goes for any other room or environment; do what suits your purpose and needs. Reasons for the recommended colors in these particular environments are also based on circadian rhythms and the effect certain colors of light have on people. For more information about light color and physiological effects, see the blog post links below. Flush-Mount LED Ceiling Lights for J-Boxes and Can Lights!